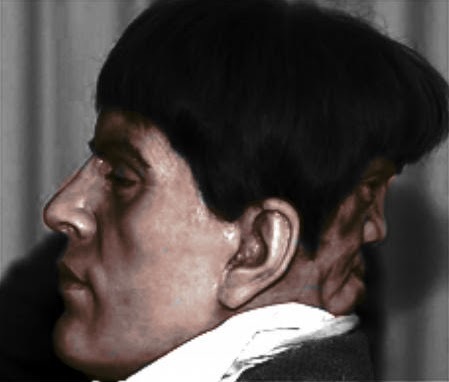 Edward Mordake was a man who lived in the 19th century. Apparently, he had everything going for him, ever-since he was a baby. He was born into a family of nobles, and was the sole heir to an English peerage (which is a hereditary title in the United Kingdom, which constitutes the ranks of British nobility), he had a loving family, but one very frightening aspect clouded his life… he had two faces… literally! There aren’t a lot of medical records from that time, but all records state the same: Edward Mordake was a charming young man, with a lovely personality. Reports of that time state that the youngster was a very beautiful boy, but just from the front, because whenever he turned around, it was like a dark cloud came about… Edward’s second face was dark, contorted, hideous and the sheer expression of pure evil. And even tho there is no way that could be verified, one thing is for sure, there came a day when Edward could not take it anymore. By the age of 23, the man had already seen a lot of doctors which he had begged to rid him of his “demon head”, because, supposedly, it whispered satanist language to him at night, but no doctor would attempt it. Unfortunately, he committed suicide at the age of 23 since nothing could be done about the evil twin. Chang Tzu Ping is also known as the two faced man… but this time, the second face is not at the back, nor is it formed as well as Edward Mordake’s evil twin. Chan’s second face was formed on the right side of his head and it mostly consisted of a mouth, teeth and a rudimentary tongue. The rest of the mouth and throat were not fully developed. There were also traces of scalp, eyes, nose, and ears. When Chang would open his mouth on his first head, the second mouth would also open. One day, an American soldier discovered him and made sure that Chang had surgery to remove the second face. After surgery he returned to his native village in China and lived there the rest of his life. Pasqual Pinon was born in 1889 and died in 1929. He was widely known as The Two-Headed Mexican, and worked as a performer with the Sells-Floto Circus in the early 1900s. The man used to be a railroad worker in Texas, Pinon was discovered by a sideshow promoter, whose was astonished by a large benign cyst or tumor at the top of Pinon’s head. The promoter recruited Pinon into his freak show and designed a special fake face made of wax and placed on the growth, and claimed that Pinon had two heads. After years of continuous touring, the circus manager paid to have the growth surgicall removed, and Pinon returned to Texas to live in peace.